Paneer tikka masala is a classical Indian delight prepared from cottage cheese. This recipe will prove to every taste bud in the world that vegetarian food is delicious along with being healthy. 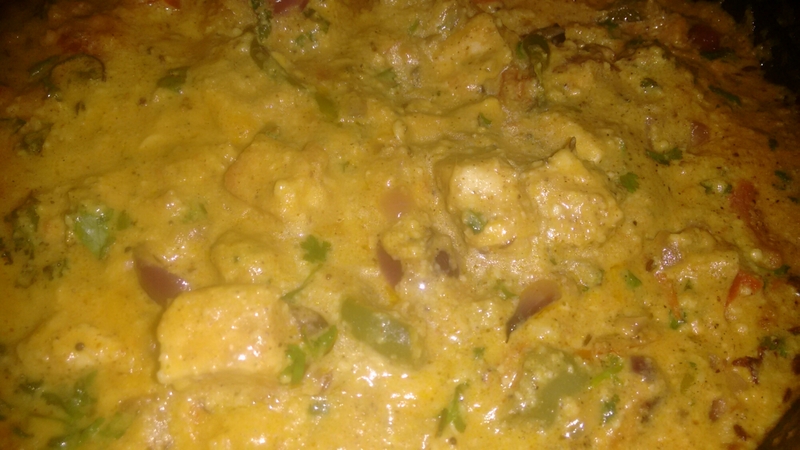 Here is my amazing recipe of paneer tikka masala. -to the Curd add red chilli powder, salt, kasuri methi, ginger garlic paste, lime juice, garam masala and oil. Mix well. – now add the cubed tomato,capsicum and onion to the Curd mix and mix well to coat all the vegetables with the marination. – Cut the cottage cheese in large cubes and put it in the bowl with the Curd. Gently coat the cottage Cheese with the marination. -Keep it aside to marinate for half an hour. 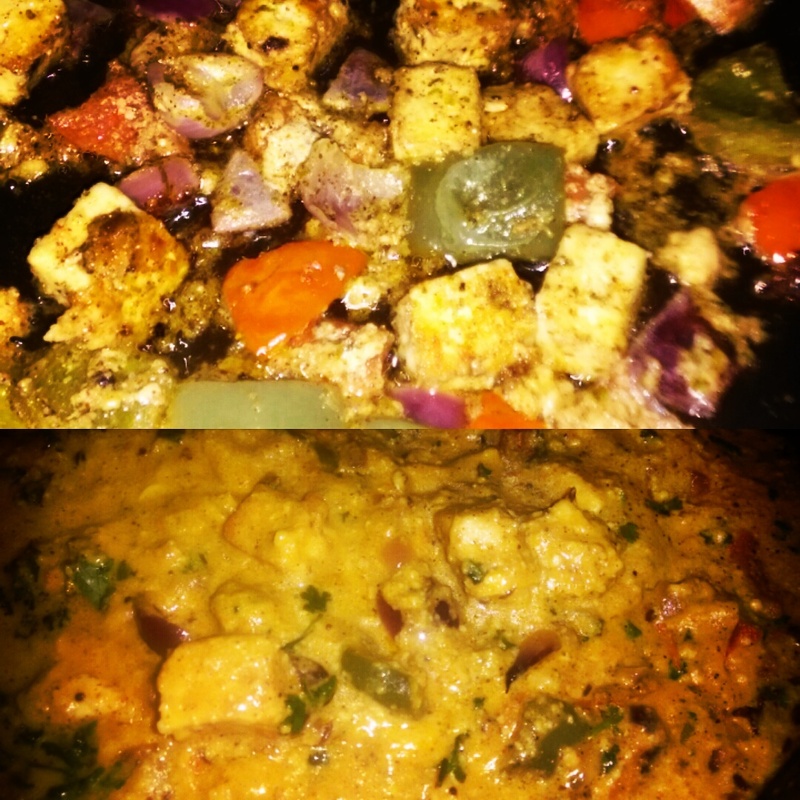 – After around 30 minutes put alternate pieces of the Paneer and the vegetables on skewers. -Heat a flat nonstick pan and brush it with oil. – Put the skewers in the hot pan and let them get a nice golden brown color on all sides. 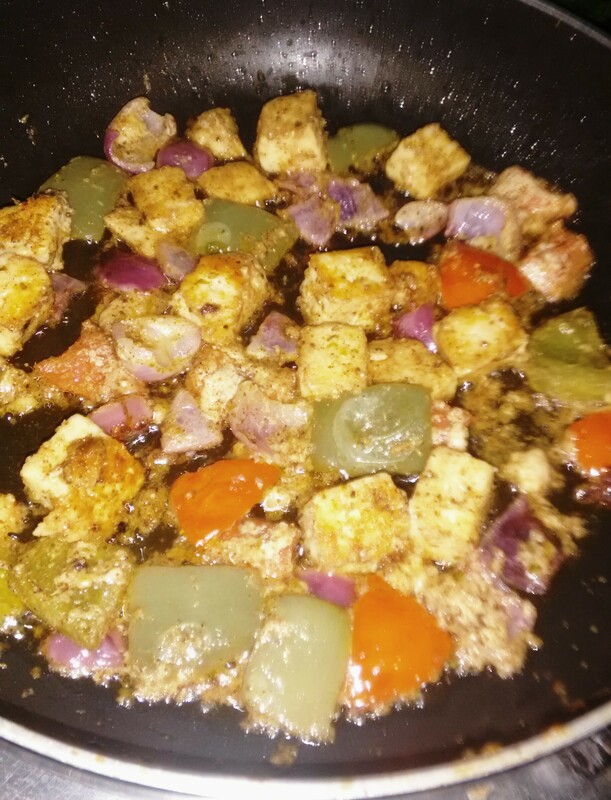 Keep brushing the Paneer and the vegetables with oil. – once cooked remove the cottage cheese and the vegetables from the skewers and keep them aside for the gravy. -heat 2 tbsp oil in a pan. – when hot add in the cumin seeds and let them splatter. -add finely chopped onions and sauté till golden brown. -add the ginger garlic paste and sauté for a minute. -mix in the finely chopped tomatoes and cook for 2 minutes. – Add chilli powder, coriander powder, garam masala, turmeric powder, salt, slit green chilies and cook till all the spices are cooked. -Add in the cashewnut paste and keep stirring till the mixture starts releasing oil. -Add a cup of water to increase the bulk of the gravy. -Add 1/2 cup of fresh cream and give it all a good mix. – Add in the golden brown Paneer tikka to the gravy. – Add 1/2 tsp garam masala and 1/2 tsp kasuri methi. – Add half a juice of lime. – give it all a gentle stir.